We live in a dynamic world, in which constant motion of events and social and economic structures continually alter the state of many activities and circumstances. For example, the advent of the personal computer in 1981 changed the way trade and commerce were done. This altered the nature of financial structures, industrial practices and communications. But it also gave rise to new laws and new needs in accounting and finance. It created a new business environment that affected all participants in the cycles. It’s an ongoing cycle that generates new problems and needs in many disciplines, including law and accounting. New financial instruments, new laws and regulations, new technology that accelerates the pace of doing business, growing internationalism, the expanding body of knowledge in so many areas and the rapidity with which it can be organized and retrieved, new demands from client – all substantially change the demands upon lawyers and accountants, and therefore, the structures and practices that professionals must adapt to stay abreast of their own clients. I think that in order to understand change, you have to start by recognizing that change is an evolutionary process, the result of which is that some thing or things are different than they had hitherto been. It’s important to recognize as well the dynamic of today’s society, in which events are impacted – sometimes randomly – by other events that are themselves impacted by unforeseeable events, and so on – all of which makes it impossible to accurately and consistently forecast. It’s not difficult to understand in this economic environment why the word change looms so large in professional services dialogue. The nature of the professions, rooted as they are in history and tradition, can be fairly rigid, and resistant to innovation. But the times seem to have accelerated the need for new ideas and structures to cope with new economic and social problems and opportunities. The accounting profession, even as we know it today, is practically pre-historic, and is now so bound by traditions, rules, regulations, and laws, that any suggestion of serious structural change is seen as a virtual assault on the professions. The codification of law firms and the legal profession go back about as far, and are just as resistant to innovation. In both cases, the rigidity in the professions is designed to maintain integrity and probity, as well as efficiency in firm governance. If the nature of products allows for constant and rapid change to match changing tastes and fashions, the nature of professional services requires a measure of uniformity and predictability. But now, there are cracks appearing in the wall. The potential for conflict between the ethical rules and their protection of integrity, and the need for successful competitive marketing, can be intense. Still, some things in the professions are different now than they were about a decade ago. We now have, for example, an increasing number of firms replacing hourly billing with value billing. We now have social media and we have bounding changes in technology. Where once associates who seemed not to be partner material were let go, now they are being kept for their specific talents and experience – the so-called two-tier firm. 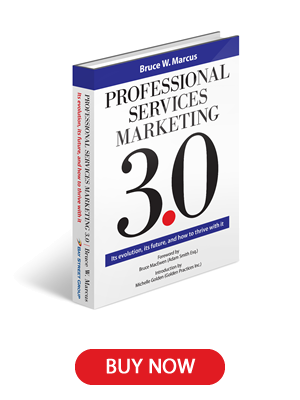 The changes in professional firm practices seem to be coming fast, giving rise to Professional Services Marketing 3.0. Cravens & Cravens, a former client of mine, is a two-person father and son accounting firm in a small town in Southern Illinois, with growth ambitions, and a keen understanding of the role of marketing in its practice. Their one advantage was an exceptional knowledge of small and medium size business. We marketed the firm by focusing on that capability by featuring the rolling forecast and the firm’s business acumen, rather than on the traditional small accounting firm services. It’s been a very successful concept and campaign, made possible by the two partners’ willingness to reach beyond traditional accounting practice techniques. While all selling must ultimately be done by the accountant, the practice of practice development, incorporating as it may the traditional tools of marketing, will be done by an accountant, or a business-development professional who is totally immersed in the practice, and has the skills and knowledge to reshape aspects of the practice — how it is presented and how it delivers its services — to better meet the needs of the contemporary client. I know that an increasing number of successful accounting firms today are doing pretty much what I’ve described here. Some of the best marketers are accountants. Some of the worst are, too. But the marketing profession is defined by its best – not its worst. Under Professional Services Marketing 3.0, practice development executives will have business, not just marketing, backgrounds. Marketing mechanics will be done by lower level practitioners, while the strategies will be formulated by the Professional Services Marketing 3.0 specialists – the accounting/marketing partners.